Global PE firm KKR betting on Chinese millennial | Muirbury & Co. 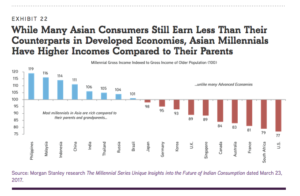 Global investment firm KKR & Co is extremely bullish on the rise of Asian millennials, particularly the Chinese Millennial, according to a recent report. In the report, Henry H. McVey, KKR’s head of global macro and asset allocation, and his Asia counterpart, Frances note the “massive opportunity” tied with the burgeoning Chinese millennial population. 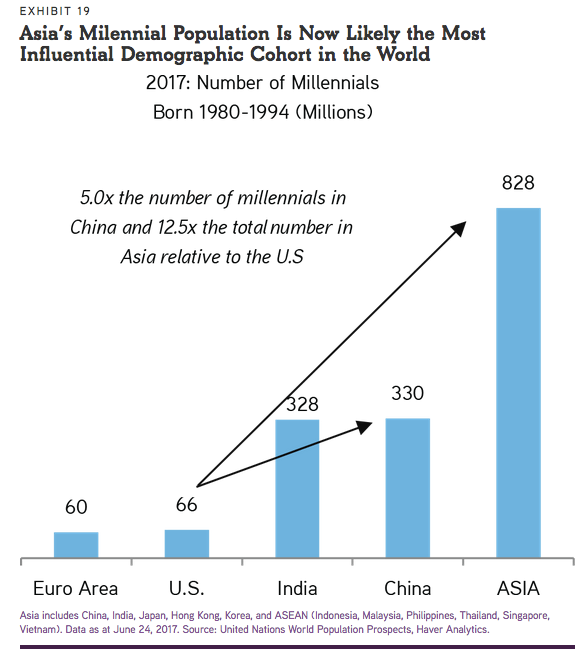 Lim estimated that out of the 828 million Asian millennials, about 40 per cent or 330 million are in China, roughly the same size as the entire population of the US. 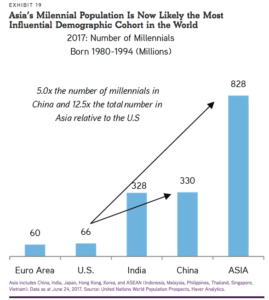 “Despite intensifying trade tensions, we are extremely bullish on secular growth trends within the Asian millennial generation, the Chinese one in particular. Not only do the numbers of Asian millennials in places like China dwarf those in the U.S. and Europe, they form the bulk of the labor force. “They are also the cohort that is now entering middle-income status in China, which suggests important shifts in buyer behavior patterns,” said McVey. Despite the ongoing trade war between China and the US, he pointed out there is a significant long-term opportunity for global investors to help fund this transition and receive potentially outsized returns along the way. 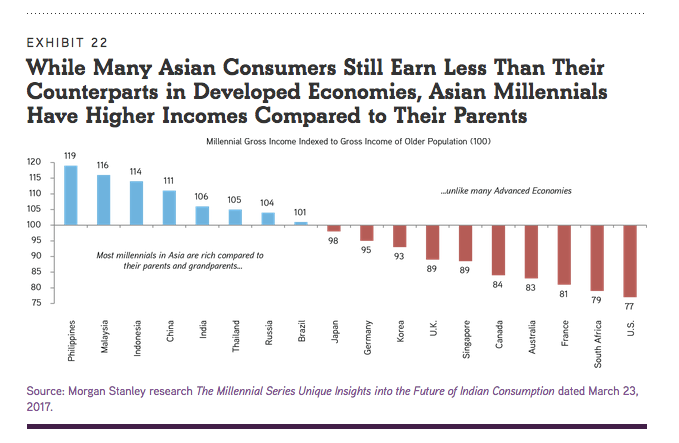 Besides the size difference in population, KKR also estimated that there is a huge income disparity between US and Asia millennials, and by comparison, most Asian millennials are rich compared to their previous generations. Against this backdrop, KKR has come to “appreciate” the distinct consumption preferences developed by Chinese millennials in recent years, who spend about one-third more on leisure, value fresher and healthier food and product alternatives than their parents, and compare prices before shopping much more than their elders and many of their global peers. “We link many of these traits to their tech-savvy ways – and it is not just goods purchased. Just consider that it only took Didi [Chuxing], China’s ride hailing leader, three years to reach 50% penetration, while Uber has yet to reach 50 per cent penetration after seven years in the US. Meanwhile, AliPay has only taken four years to hit a penetration rate of 50 per cent, while ApplePay has yet to reach the 50 per cent milestone in the US,” said McVey. KKR attributed the rapid adoption of technology throughout China to the booming logistics industry where courier costs are low and population density are high along with the emergence of a growing middle-class which is unimpeded by traditional channels. As a result, the Chinese internet economy was 6.9 per cent of the country’s GDP in 2016 – a full 150 basis points larger than the 5.4 per cent of GDP in the U.S.
“We think that number is even larger today given the trends we see in online shopping, particularly when you consider that China’s Internet penetration is just 53 per cent versus 76 per cent for the US,” said the firm. On top of that, e-commerce took up a 44 per cent share in China’s internet market revenue breakdown (estimate) in 2016, as stated in a recent study by BCG whilst in the US, the figure is 27 per cent. McAvey also noted that the younger generation in China values experiential over materialistic satisfaction. Amusement parks, travel, and theatre all appear to be gaining momentum as a share of consumers’ wallets, he writes. Other sectors that are taking off including personal financial services, healthcare services, wellness/beauty, healthier foods, and food safety. “We also anticipate continued demand for China to tackle air, water and soil pollution, likely creating opportunities for companies that address these issues. 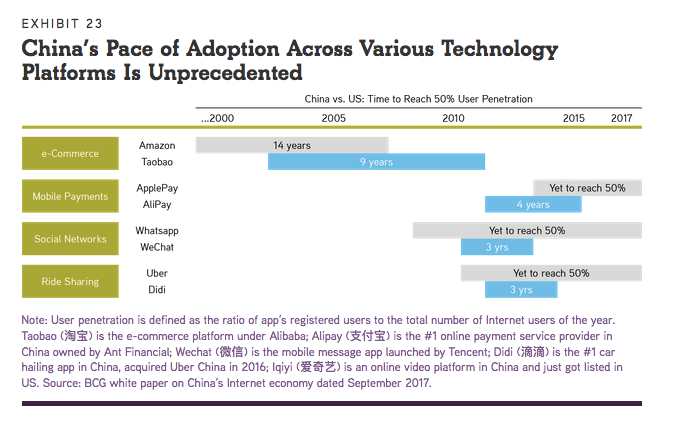 “Importantly, though, the Chinese consumer is becoming increasingly sophisticated, which is leading to a more demanding customer who uses technology more often to drive value, select aspirational brands over standardized ones, and comparison shops more often than in the past,” wrote McAvey. KKR also raised concerns about traditional goods, particularly food items offered by multinationals that are losing appeal. On top of that, these multinationals’ distribution networks are being squeezed by higher costs and increased competition. Does this mean that KKR will be focusing its investments into China – having raised a record $9.3 billion for its third Asian vehicle last June? The fund is the largest ever raised in the region, exceeding KKR’s original target of $8.5 billion. The rising middle-class in Asia has lured many global PE firms to raise increasingly larger vehicles to double down or start to invest in the region. Trailing closely behind KKR’s record vehicle is China-focused firm Hillhouse Capital Management that is raising $8 billion for its Asia-focused vehicle to invest in the consumer, TMT, industrials and healthcare sectors. Hong Kong-based Baring Private Equity Asia is currently raising a $6 billion Asian vehicle and has hit its first close at $4.5 billion. US-based TPG Capital is also on the road to raise $4-4.5 billion, while CVC Capital Partners is said to be gearing up for its fifth Asia fund with a target size of $4 billion and a hard cap at $5 billion. Another US-based firm, Carlyle Group, is nearing the close of its Asian fund at $6.5 billion.